Q: Call routing refers to the ability to route calls based on criteria such as origin, destination, time of day, service provider rates, etc. 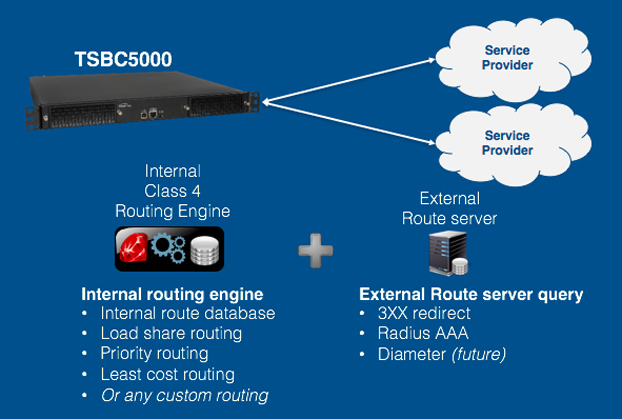 Why is TelcoBridges call routing considered among the best in the industry? A: First it’s important to note that it’s not an add-on, it’s our default routing engine… One of the reasons is the way we do our routing. It’s not based on simple tables, it’s based on script routing, so our engine is running scripts. The reason for that is to adapt the routing to each and every one’s specific needs. So that is what we are capable of doing, we don’t force everyone to match our implementation of a routing scheme. We say, ok, how do you want us to route your calls, and what are the criteria that you want us to take into account, and we will do it as requested. Is it a criteria per trunk group, per call, per caller? Per whatever criteria is wanted we will do it and we will adapt the routing scheme to their business logic. Not the opposite. We also have incredible routing options, we can route using our class 4 scripting engine, we can query external resources, databases, to get other parameters to route the calls – for example, is the call allowed, what is the best route – we can tap external databases for this kind of information and act on this information. We have great flexibility internally and the flexibility to ask externally for more parameters to take routing decisions.